Let me break it down into components: This banana cream tartlet is composed of five things: the tart shell, the pastry cream, banana, whipped cream and almond praline. -This is the easy part. There a few options for frozen shells in the grocery store. Choose your favourite brand and bake them according to their specifications. 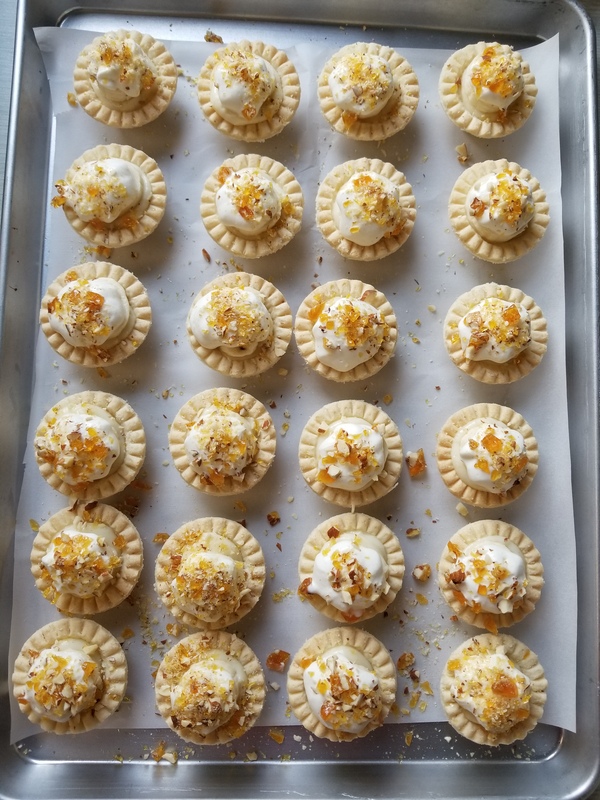 I also poke holes with a fork in the bottom of the tarts and put a little piece of parchment paper with pie weights in them to prevent the shells from puffing up too much when they bake. I made some with my leftover pie dough from my previous pie recipe for my vegetarian friends at work because (oops!) the store-bought shells I got had lard in them. These are the ones I made….not as pretty as the store bought but they didn’t have lard. Cooking is all about thinking of alternatives on the fly! While your pastry shells are baking in the oven you can prepare the crème pâtissière or ‘pastry cream’. I like pastry cream because it has a thicker consistency and it doesn’t taste as eggy as some custards do. I found this recipe here and it has worked every time, so I highly recommend it. You whisk the flour, sugar and eggs together while you bring the milk to a simmer. Then you slowly whisk in the hot milk to temper the egg mixture and add it back to the pot and cook it until it comes to the boil, reduce the heat and cook for a few minutes and then let it cool down. After it cooled I added a bit of vanilla bean paste and two capfuls of orange blossom water (my secret weapon). You can purchase orange blossom water at most Mediterranean grocery stores. Once you whisk in the flavours of vanilla and orange blossom, set the cream aside in the fridge. Originally I had plans of cooking the banana component with butter and deglazing the caramelized bananas with rum and brown sugar. And I did. But then I made a poor decision and blended it. Note to self kids, don’t blend bananas. It turned into glue, a starchy yammy glue. It tasted good but the consistency was awful. So I opted for using a slice of fresh banana in its purest form, simple and you get the taste of banana. Took me a while to get there but I got there in the end. I whipped some heavy cream until soft peaks formed. Then I dusted in some powdered sugar and maybe 1/8th of a teaspoon of cardamom powder. I adjusted the sweetness and spice level to my own taste. Cardamom is one of my favourite spices to use. It’s powerful and can be somewhat soapy to some people so use with caution. I personally can’t get enough of it! Chop some almonds and spread them out evenly over a sheet pan lined with parchment paper. Lastly, I made a dry caramel with granulated sugar in a dry pan on medium heat. Heat your sugar in a pan and stir with a rubber spatula or wooden spoon. The sugar will start to melt around the edges and it’s fascinating to watch the sugar transform. Keep stirring and it will eventually start to dissolve and melt into the rest. Once the mixture is clear, add a pinch of salt, reduce the heat if it’s starting to smoke. I like to push my sugar to a nice amber colour, but sugar is finicky, it can burn within seconds so don’t leave the stove! Use your nose, burnt sugar is very distinct. If you want to cool your sugar down quickly after you get the colour you want, you can put the bottom of your pan directly into an ice bath to stop the cooking process. Pour the caramel over the almonds as evenly as possible and let it cool until brittle. Break the praline into pieces and chop to your desired size. Construct your tarts with some pastry cream, a slice of banana, some whipped cream and top it with your praline bits. Previous Apple and Pear Pie with Pecans and Ginger!